It takes a highly skilled surgeon to undo the work of a previous plastic surgery, particularly when it involves the intricate structures of the face. For excellence in facelift revision, trust Dr. Sanaz Harirchian in Houston. She is an elite facial plastic surgeon who brings an Ivy-League education and distinguished fellowship training in facial cosmetic surgery. With her depth of experience and attention to detail with face & neck procedures, you can trust that she understands how to seamlessly correct a facelift that produced a poor or undesirable outcome. It can be devastating to realize that your facelift results failed to meet your expectations and goals. Whether your facelift surgery was over-performed, under treated or simply looks unnatural, we can help you at our Houston plastic surgery center. With her specialization in revision facelifts, Dr. Harirchian welcomes the opportunity to give you the beautiful and natural results that you had originally hoped for. There are a number of factors that can compromise a facelift outcome, including a surgeon who lacks proper training or one that used a one-size-fits-all approach. Dr. Harirchian not only uses the most proven facelift techniques in the industry, but she strongly values a tailored approach that considers the unique needs of each patient. This involves taking into account the skin type, aging patterns and individual goals of the patient. When it comes to facelift revision, Dr. Harirchian is equipped to correct a surgery that was over performed, often leaving the patient with a pulled, unnatural or hollowed appearance. She also understands how to improve facelift surgery that failed to fully address sagging skin and wrinkles on a long-term basis, which occurs in under-treated facelifts. 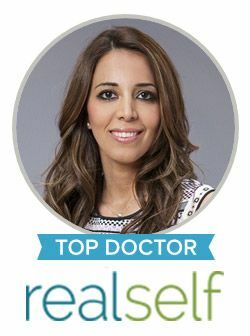 Dr. Harirchian is a reputable facelift surgeon who places strategic incisions and uses a modified deep plane technique, which repositions the underlying or deeper structures of the tissues instead of simply pulling the skin tight. This creates a more long-lasting and natural outcome. If you are unhappy with your recent facelift, contact Dr. Sanaz Harirchian today to schedule a consultation. Your facelift revision can allow you to claim the beautiful look you deserved the first time.